FGCU women’s soccer striker Evdokia Popadinova just pulled off a different sort of hat trick, a three-peat as Bulgaria’s top female footballer. “To win something so big for three years in a row, it means a lot to me to be the best player in the whole country,” said Popadinova. The Eagles star striker was born in Hadzhidimovo, Bulgaria and had already earned Bulgeria’s best athlete award twice, as well as become a two-time NAIA All-American, before moving to Southwest Florida and joining Jim Blankenship’s roster in the 2018 season. In just one year with Eagles soccer, she’s already become a weapon on the field for FGCU, leading scorers with 14 goals this past season. After Bulgaria named her their top female footballer for a third straight year in 2019, Popadinova said she’s honored as an individual but proud to be part of a team. 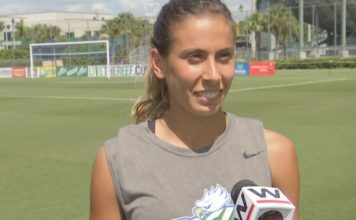 Popadinova said another goal she has heading into her senior year is for the FGCU women to beat their previous 12-game winning streak in the coming season.